Dr John McKenzie has worked in China for over 5 years and currently is Business Development Manager for Harlan Laboratories. John has a doctorate in Chemistry from Glasgow University and is a Fellow of the Royal Society of Chemistry. He has worked for over 20 years, employed by some of the largest CROs, as Study Director for pesticide registration and as Laboratory Manager. This article will explain how many field trials should be conducted and where they should be done when register a pesticide in Europe. 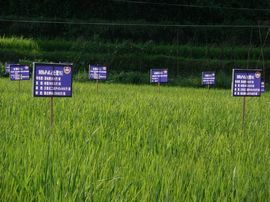 There are some parts of conducting Field Trials that are quite unique and different to the conduct for GLP; there has to be additional considerations to enable a control and consistency of field trials conducted over different geographic regions and different countries, even continents. Without field trials there is the potential of no improvement in performance and perhaps introducing hazards to the environment.